LOGAN, Utah – TJ Woods, who has 16 years of collegiate coaching experience, and has coached in five bowl games, has been named Utah State’s offensive line coach, it was announced Tuesday by Aggie head football coach Gary Andersen. This will be Woods’ second tenure with Utah State as he also coached the Aggies from 2009-12. In all, Woods has spent nine seasons under Andersen at three different schools. 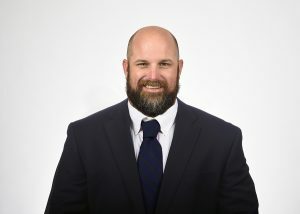 Prior to his appointment at Utah State, Woods spent the 2018 season as the offensive line coach at Western Kentucky. At WKU, Woods inherited an offensive line group that did not return a single starter at their respective position and just two starters – at any position – from the 2017 group. It was also a position group that did not have a single senior in the room, one of only three teams in the nation without a senior offensive lineman. Under Woods’ direction, the Hilltoppers’ offensive line turned into one of the team’s strengths by season’s end. From the 2017 to 2018 season, Western Kentucky’s rushing yards per game improved by 75.98, eighth-best nationally, and its yards per carry increased by 1.72, fifth-best nationally. Furthermore, WKU allowed 16 fewer sacks in 2018 as compared to 2017, the 10th-best improvement in the nation. Woods came to Western Kentucky following a three-year stint at Oregon State, where he coached four offensive linemen to Pac-12 All-Conference honors and saw two of his linemen, Sean Harlow and Isaac Seumalo, get drafted into the NFL. Harlow was a fourth-round selection of the Atlanta Falcons in 2017, while Seumalo went in the third round to Philadelphia in 2016. Under Woods’ direction, the Oregon State offense carried the ball for a school-record 5.2 yards per carry in 2016 and increased its scoring average by more than a touchdown that season. The native of San Dimas, Calif., was also a leader of men in the classroom as seven of his offensive linemen were named to the Pac-12 Conference All-Academic team during his time in Corvalis. Prior to Oregon State, Woods served as the offensive line coach at Wisconsin, where his group helped block for running back Melvin Gordon during his monster senior season in 2014 when he won the Doak Walker Award and was a Heisman Trophy finalist. That season, Gordon rushed for 2,587 yards, second-most in a single season in FBS history, and set the FBS single-game rushing record with 408 yards. Behind Woods’ offensive line, Gordon and fellow running back Corey Clement set the NCAA record for rushing by two backs with 3,536 yards. That 2014 season also saw the Badger offensive front set a school record for fewest sacks allowed with 13, as well as a Big Ten Conference record with 4,482 net rushing yards. In his first season with Wisconsin in 2013, the Badgers set a then-school record with 3,689 rushing yards, to go along with a school record 450.8 yards per game of total offense. With Woods’ offensive line leading the way, Gordon and fellow running back James White became the first running backs in NCAA history to each eclipse 1,400 rushing yards in the same season. All totaled, Woods mentored seven All-Big Ten players at Wisconsin, including four All-Americans, and helped offensive lineman Rob Havenstein get his name called in the second round of the 2015 NFL Draft by the Los Angeles Rams. Before Wisconsin, Woods spent four years at Utah State (2009-12), including the final two directing the offensive line. The Aggies rewrote the offensive record books by setting then-school records for offense in consecutive seasons, concluding with 6,108 yards in 2012. Woods coached five players to All-Western Athletic Conference honors, including Tyler Larsen and Philip Gapelu in 2011, who became the first duo of USU linemen on the first team since 1997. Larsen, who earned second-team All-America honors as a senior in 2013, is now a five-year NFL veteran having spent the past three seasons with the Carolina Panthers. A former player at Azusa Pacific (2001-02) as well as Iowa State and Citrus Junior College, where he earned NJCAA All-American honors in 1999, Woods got his coaching start as a graduate assistant at Azusa Pacific in 2003. After a two-year run as the school’s tight ends coach, where he coached Ricky Burgan to NAIA All-American honors, he spent a season coaching the offensive line at Citrus before going to New Mexico for two seasons to serve as a graduate assistant on the offensive line. Offensive lineman Eric Cook was drafted from New Mexico in the seventh round of the 2010 NFL Draft, while Byron Bell was named a freshman All-American in 2008. Currently, seven of Woods’ former offensive line pupils are active on NFL rosters, including Bell (Green Bay Packers), Larsen (Carolina Panthers), Havenstein (Los Angeles Rams), Harlow (Atlanta Falcons), Seumalo (Philadelphia Eagles), Ryan Groy (Buffalo Bills), and Tyler Marz (Tennessee Titans). Woods and his wife, the former Kelly Williams, have two daughters, Madison and McKenzie. A 2002 graduate from Azusa Pacific with a business degree, Woods continued to pursue his education and earned his Master’s in Physical Education from Azusa Pacific in 2005. Wisconsin (2) – Capital One, 2013; Outback, 2014. Utah State (2) – Famous Idaho Potato, 2011; Famous Idaho Potato, 2012. New Mexico (1) – New Mexico, 2007. Utah State – Western Athletic, 2012. Wisconsin – Big Ten Conference West Division, 2014.